RBT: I got involved when a close friend Ralph Rosa was diagnosed in 1997. With the support of family and friends he started a non-profit organization “Multiple Sclerosis Research Foundation” www.msrf.org, run by us, all volunteers, no paychecks, all proceeds have gone directly to researchers.We set up fundraising events, I’d donate a piece of my merch sales. I have a feeling this year there’s gonna be some big developments in treatments. 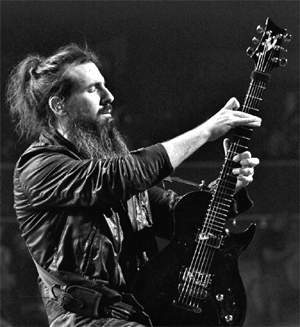 RBT: Throughout last year I released original and cover songs, one at a time off my site www.bumblefoot.com. Each release would include hi-quality audio formats, instrumental versions, a ‘Player Pack’ that has a detailed lead guitar transcription, reference mix with the lead guitar boosted and a mix without any lead guitar to play along with. Also released a ‘Producer Pack’ of mix stems, stereo mixes of each instrument and vocals so people can make their own mixes and edits with whatever multi-track software they have. It’s something I wished I could have had growing up, and something I know people today would appreciate having. Maybe it’ll become a new way of releasing singles, who knows? Producing-wise, there’s a talented rock singer from Mexico named Poc, right before leaving on the 2011 GNR tour I produced her soon-to-be-released debut album ‘Rise Above’. I did all the music, Frank Ferrer from GNR laid all the drums, had fans Skype in their backing vocals as we’d livestream the recording sessions, had her open for GNR in Mexico and it went over well, now we’re just prepping for the album release and whatever can come next for her. Most of the album is in Spanish, we’re still building her sites and organizing, I’m handling her bizz meanwhile. You can hear the first song we’re putting out “Rock N Roll Baby”, fun anthemic arena-ish song, it’s at www.pocnation.com. RBT: Thank you for the interview, and thank you all for reading! I’m at www.twitter.com/bumblefoot and www.facebook.com/bumblefoot , say hi any time. Happy 2012 ! !